Home→Micro Business/Macro World→Networking→Sue O’Kieffe’s Mandala Giveaway!! 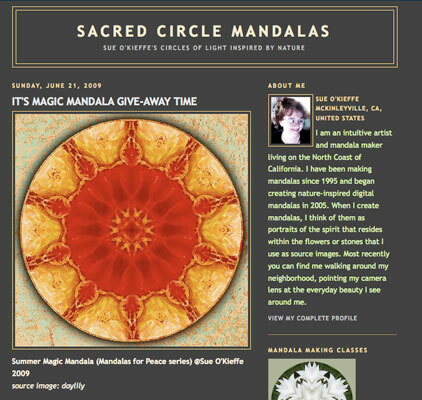 Sue O’Kieffe of Sacred Circle Mandalas (http://sacred-circle-mandalas.blogspot.com) has a wonderful giveaway! !Â Here is the post with the details.Â It is very simple to enter and she creates FANTASTIC mandalas! !Â Don’t know what they are?Â Go check out her blog! Sue has started selling her lovely mandalas! !Â Check it out!! Sue has a great newsletter she just started too.Â It is easy to sign up for it when you enter (if you like – no pressure).Â Thank you for checking Sue’s giveway and mandala’s out!! How are you doing? Thank you for stopping by! Where do I sign up for Sue’s newsletter?